Last Tuesday I kicked off the 2014 Gift Guide with the beginning of my look at Scream Factory's output for the year. But before we launch into episode two of that, I also wanted to highlight that we'll be covering a huge number of titles from a ton of other labels as well. Today is part one of a two-part look at Warner Home Entertainment releases and box sets. I know a lot of you guys loved Godzilla (2014). Me not so much. But I did discover how amazing it looks on Blu-ray on a big screen TV. I was also happy to see Blu-ray debuts for Michael Moore's more timely than ever Roger & Me (1989) and the director's cut of Sergio Leone's epic Once Upon A Time in America (1984). Edging into solid gifting consideration are the next few releases. The Audrey Hepburn Collection contains three of her most beloved films; Sabrina (1954), Breakfast at Tiffany's (1961) and Funny Girl (1968), and even has a nifty cardboard slipcase. The Hobbit: The Desolation of Smaug (2014) Extended Edition does exactly what Peter Jackson's longer director's cuts usually do, turning an already highly enjoyable film into a better one. 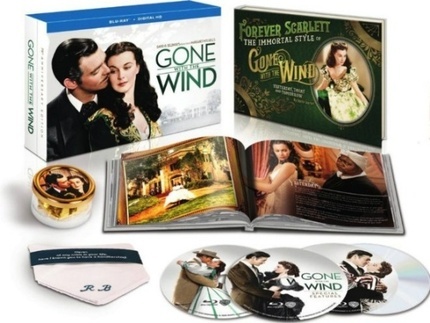 Lastly Warner really did knock me out with their nice longbow release of the Gone With The Wind (1939) 75th Anniversary Edition, which offers a nice hardcover book, a replica of Rhett Butler's famous handkerchief and a small music box that plays the film's theme. Among the countless hours of extras, Warner even includes a six-hour documentary on MGM history titled MGM: When the Lion Roars. Keep checking back. The Holiday Gift Guides are going to come fast and furious this year. Have Your Say: Which Monster Should Be Next? BOOZIE MOVIES HAS SEEN GODZILLA, AND IT'S GOT SOMETHING TO SAY. IT WANTS TO KILL YOUR DOG AND BABY TODAY!